Members of the Lone Wolf Cruisers Club bring their antique and classic cars to Arnie’s Place on Tuesday evenings. One in a series on iconic New England eateries. 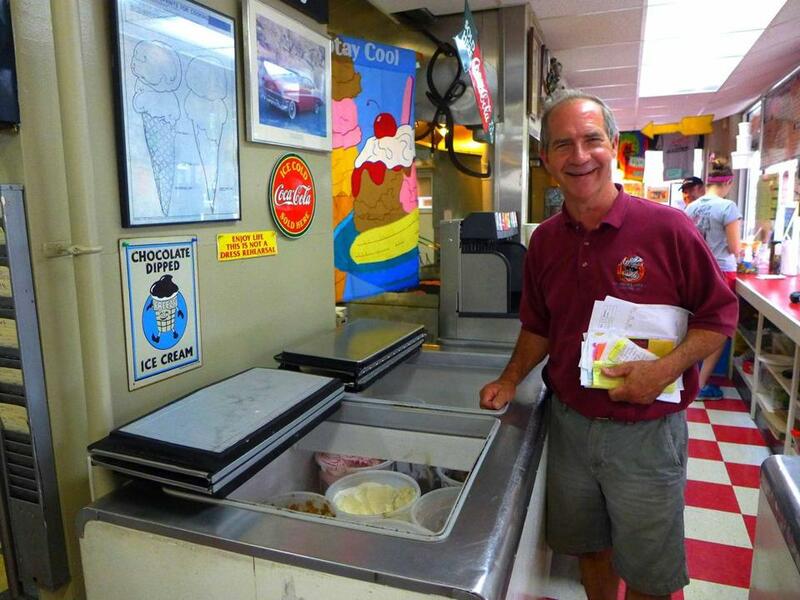 CONCORD, N.H. — When you step to the counter to place an order at Arnie’s Place, be sure to ask the invariably cheerful clerk to leave your tab open. Once you have eaten your meal, you will surely want to return for ice cream. Most casual takeout spots have one specialty — hot dogs, for instance — but Arnie’s has three: juicy burgers, tangy barbecue, and creamy homemade ice cream. “The pulled pork sandwich is the most popular,” Grace Orzechowski told us as we perused the menu. “We smoke the pork overnight and pull it every morning.” Burger lovers gravitate to the Arnie Burger (with bacon, onion, American cheese, lettuce and tomato) or the Bubba Burger (with BBQ sauce, cheddar cheese, onion, pickles, and bacon). Sides of Arnie’s good potato salad and excellent baked beans round out a meal. Tom Arnold, founder of Arnie's Place, says he has the best job in the world. In 1992, Tom Arnold rescued a 1960s-era Dairy Queen building, converted it to Arnie’s, and set about creating a local landmark. “It was an old, funky place,” he recalled as he watched his staff pivot around each other in the cramped quarters. Arnold got the recipe for his pork rub from Jeff Paige, the chef-owner of Cotton in Manchester, and has amassed his ice cream recipes — some more than 70 years old — through networking and his involvement in various ice cream organizations. He most likely got his feel for a good burger from his father, who worked at the original Friendly’s in Massachusetts before eventually buying a Weeks Ice Cream and moving his family to Concord in 1964. “We represent the end of winter,” said Arnold, who closes shop from mid-October through early February. 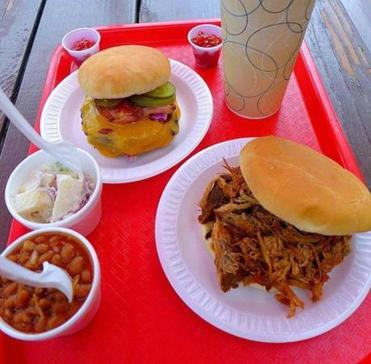 Arnie’s also represents the lazy days of summer when friends and family can sit out at picnic tables, tap their toes to oldies, dig into foods that require lots of napkins, and forget about calorie counts. The pulled pork sandwich and the Bubba Burger. Marty Fuller stops by every week. “Arnie’s is my destination walk on Tuesday,” she said, clearly pleased that she lives within walking distance. Fuller sometimes brings her grandson or meets friends. She usually limits herself to a kiddie-size frozen yogurt, but had decided to splurge on a kiddie-size ice cream sundae, reasoning that she had eaten a light dinner at home. It’s even better with a little hot fudge and whipped cream. ARNIE’S PLACE 164 Loudon Road, Concord, N.H. 603-228-3225, www.arniesplace.com. Daily 11 a.m.-10 p.m. (9 p.m. during school year) through Columbus Day. Sandwiches $3.25-$6.95, ice cream $1.50-$6.50. Classic Car Cruise Nights May-October, Tuesdays, 5-8 p.m.
Patricia Harris and David Lyon, authors of “Food Lovers’ Guide to Vermont & New Hampshire,” can be reached at harris.lyon@verizon.net.